Dental scaling is routinely performed to help patients with gum disease and excessive plaque buildup. While a standard cleaning will address the surface of the tooth, scaling goes much deeper. If your dentist suggests dental scaling and root planing for your teeth, it’s helpful to know what this means so you can prepare for what’s ahead. If you have pockets of 4 millimeters or more, your dentist will probably recommend dental scaling to remove the plaque beneath the gumline and help treat the gum disease. Dental scaling involves the careful removal of plaque bacteria from the tooth’s surface just below the gumline. There are two basic methods for scaling teeth. 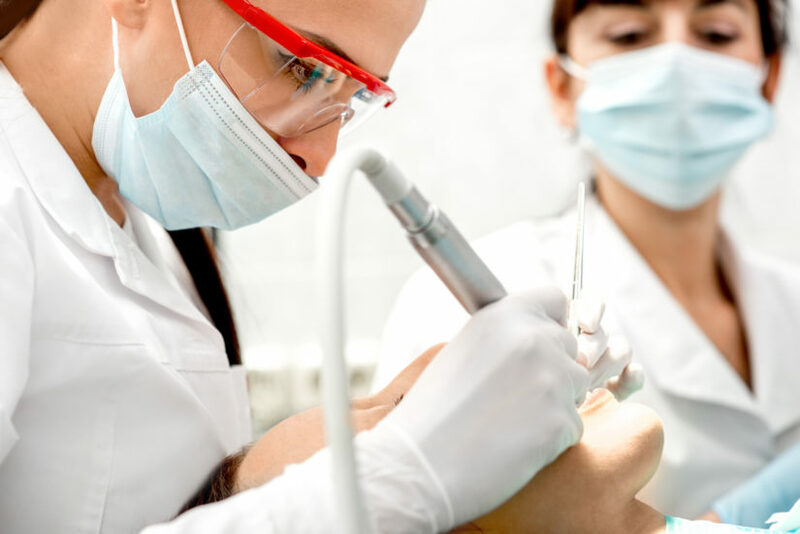 If your dentist uses handheld instruments, he or she will scrape plaque from the tooth using a metal tool known as a dental scaler and curette. The dentist will insert this thin tool beneath the gum line to access plaque your toothbrush can’t reach. What Does Scaling Feel Like? Dental scaling can be uncomfortable, particularly if you have sensitive gums. Your dentist may offer a local anesthetic to numb your gum tissue and make the procedure more comfortable. Speak with your dental care provider about your options for desensitizing the area if you’re concerned about pain or discomfort during the process. Dental scaling can take several visits, each one addressing a different portion of the mouth. Some dentists divide the mouth into four quadrants, while others will perform dental scaling in two halves. If you’re nervous about the process, ask your dentist if you can schedule your scaling for a single visit. Though this isn’t an option for all cases, it may be available if you have only moderate gum disease and are willing to sit for a lengthy procedure. Your mouth may feel sore and sensitive after your dental scaling and root planing. Some patients experience swelling or bleeding for a few days following the procedure. Your dentist may suggest a desensitizing toothpaste to help ease this discomfort. You might get a prescription mouthwash to use after the procedure, as well, to help keep the gums clean. It’s crucial that you use proper brushing and flossing procedures after your scaling to stop plaque from forming again in the same areas. Your dentist should schedule a second a visit after your dental scaling to examine the gums, measure the depth of your gum pockets, and make sure your mouth is healing properly. If the gum pockets have gotten deeper since your scaling, you may need to explore additional treatment options to help you maintain a healthy smile. Dental scaling is a very common treatment for patients with gum disease. Nearly half of American adults have gum disease, so you’re not alone if your dentist recommends this procedure. Scheduling dental scaling as needed can help you battle unseen plaque and maintain a cleaner mouth. If your dentist indicates that you need a deep cleaning, don’t hesitate to schedule this appointment. The result is a fresher smile that you’re sure to enjoy.